This is a follow-up to a previous post on the regioselectivity of C-H arylation reactions of heteroaromatic compounds. The direct C-H functionalization of aromatic compounds (including heterocycles) via transition metal catalysis has emerged as a powerful alternative to electrophilic (or nucleophilic) aromatic substitution and transition metal-catalyzed cross coupling reactions. If you’re looking for an overview, Jie Jack Li has edited an excellent book on the general subject of C-H bond functionalization entitled C-H Bond Activation in Organic Synthesis. Heterocyclist readers are directed to Chapter 10 by Donna A. 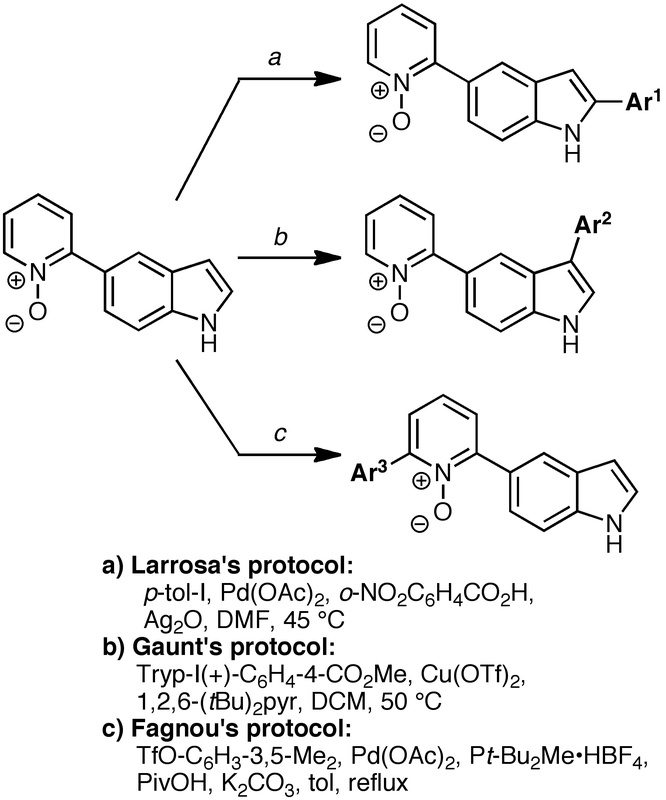 A. Wilton for a treatment of C-H activation in heteroaromatic compounds. In a previous post, we considered the regioselectivity of C-H arylation reactions of heteroaromatic compounds, focusing on substrate-based regiocontrol, i.e., factors in the heteroaromatic compound that influence the site of C-H functionalization. In this post, we consider emerging examples of conditions-based regiocontrol, i.e., modifying the reaction conditions, including the catalyst itself, to direct the regioselectivity of heteroaromatic C-H arylation reactions. While there is little in the way of a satisfying mechanistic rationale for these results, it’s a promising synthetic approach. For entry into the relevant literature on this strategy, take a look at Engle and Yu’s JOC Perspective and Neufeldt and Sanford’s review in Accounts. Next up, in very recent work by Bedford, Durrant, and Montgomery (U Bristol and Vertex), regiocontrol in the palladium-catalyzed arylation of pyrazolo[1,5-a]pyrimidine was achieved by tuning the catalyst. The presence of a phosphine ligand directed arylation to C-7, the most acidic C-H as determined by NaOD exchange. 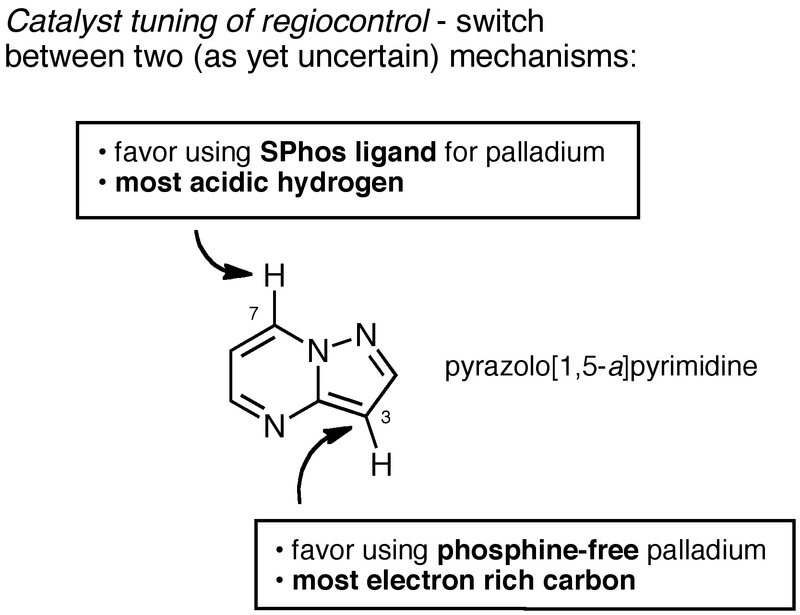 In contrast, phosphine-free conditions favored arylation at C-3, the most electron-rich carbon as determined by calculations. The two processes are believed to involve different mechanisms, though the details are not yet known. The SPhos ligand system was homogeneous. Deuterium labeling studies showed that coordination to palladium was followed by a slower deprotonation that was still not the rate-determining step. The phosphine-free system was heterogeneous and proceeded with a protracted induction period via two discrete catalytically-active species. 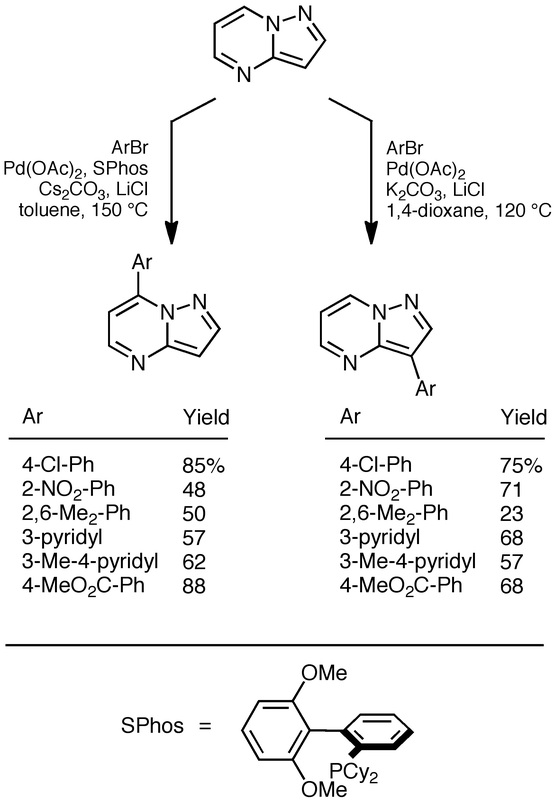 Finally, consider the promising work of Yu and co-workers on the arylation of pyridines. Six-membered-ring heteroaromatics are still relatively rare substrates for C-H functionalization because of the basic nitrogen, which tends to bind to the metal. Most examples rely on making the N-oxide to circumvent this problem (e.g., the Fagnou example above), but Yu has been able to arylate simple pyridines by adding 1,10-phenanthroline, which competes well for the palladium, allowing the pyridine substrate to enter into the activation cycle. Further advances in the understanding of substrate-control of regioselectivity combined with efforts at conditions-based control will surely elevate C-H functionalization to a new level of predictability and utility. Update: Hong, et al. (KAIST), have recently published a nice paper on catalyst-controlled divergent C4/C8 regioselective C-H acylation of isoquinolones. Aryliodoinium salts were used as the aryl donors. 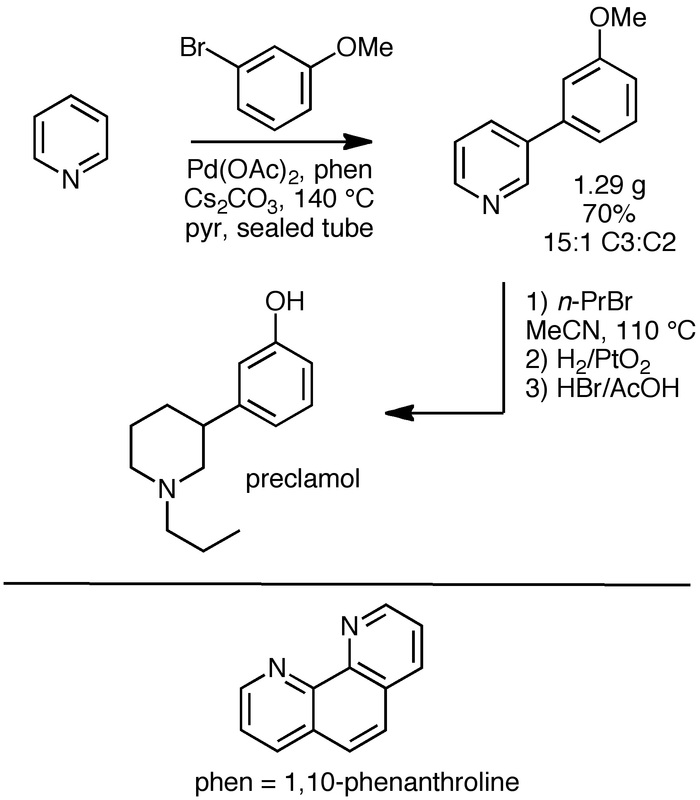 C4 selectivity was achieved via an electrophilic palladation pathway; C-8 arylation was performed using an Ir(III) catalyst. Interested in a heterocycles course at your company?